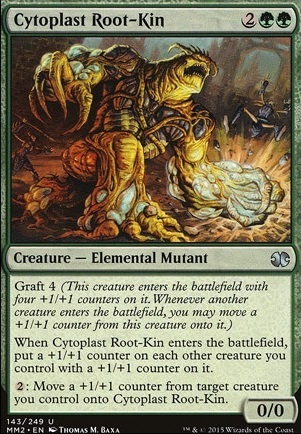 When Cytoplast Root-Kin enters the battlefield, put a +1/+1 counter on each other creature you control that has a +1/+1 counter on it. Howdy, I have a few suggestions for your deck if you don't mind. First, I would cut about 5-6 lands from the deck. Most commander decks only need about 37-38 lands in my opinion, and considering that you've got a pretty good mana curve, I think your deck would run well without the extra lands. 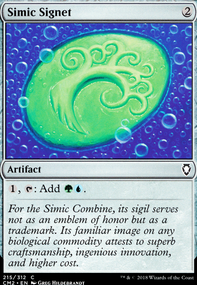 Second, I would look into some of the simic graft creatures from the very first ravnica block. Cytoplast Manipulator and Plaxcaster Frogling and Cytoplast Root-Kin are some of my favorites. Third, I would also like to recommend Wild Beastmaster and Increasing Savagery and Chasm Skulker . I think those cards work very well together, but they also work pretty well with the rest of your deck's strategy. Lastly, I would like to see some more card draw and mana acceleration affects. You've got a few of each, but I think your deck could benefit from more. Since we start with 40 life instead of 20 in commander, we have lots of time to deploy bigger and better effects, and card draw/mana ramp are essential to your decks consistency and power level. Nice deck! 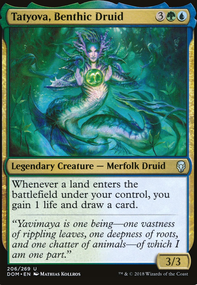 I would check into some of the simic graft creatures from the very first Ravnica block. Cytoplast Manipulator and Plaxcaster Frogling and Cytoplast Root-Kin are some of my favorites. Contagion Clasp , Armorcraft Judge , Cultivator of Blades , Cytoplast Root-Kin , Feral Hydra , Forgotten Ancient , Genesis Hydra , Heroes' Bane , Renegade Krasis , Ridgescale Tusker , Increasing Savagery , Overwhelming Stampede , Animation Module , Contagion Clasp , Ring of Kalonia , Inspiring Call , Magistrate's Scepter all could be good. You know what could be absolutely bonkers in this deck? God-Pharaoh's Gift or Hour of Eternity. 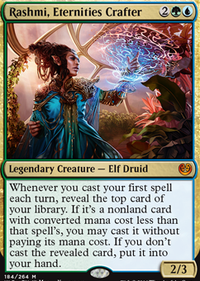 On your turn, you could reanimate a Cytoplast Root-Kin as an 8/8. Bonus points with Doubling Season: you'd get two 14/14's. Copy the 4/4 token, copy the 4 +1/+1 counters, then get another 2 from the other's ETB effect. 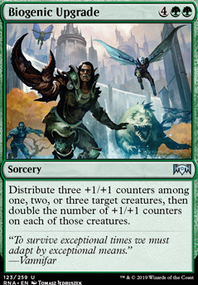 If you're going to run Infect, have you considered Triumph of the Hordes ? Blighted Agent is slow and will get aggressive reactions from other players - Triumph in this deck may very well be a "Win the game" card in many cases. Best part is, you do it on the same turn it's cast. 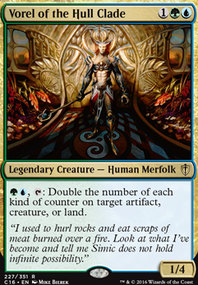 One final thing you might want to consider are the series of "Storage lands" such as Mirrodin's Core and Calciform Pools to get proliferation on your mana as well.